The 303 stainless steel American manufactured wedge anchor is made with a 303 stainless steel clip permanently attached. They will be shipped the same business day that the order has been placed. •	American Drop-in stainless steel anchors can be used only in solid concrete; they are not designed for and should never be used in brick or block base materials. •	The American Drop-in stainless steel anchor can be used in atmospheres where moisture is present, as well as in overhead applications for threaded rod, pipe, HVAC and electrical runs. •	The American Drop-in stainless steel anchor requires the use of a setting tool; each setting tool is purchased separately. •	The designated diameter of the setting tool is equal to the diameter of the American Drop-in stainless steel anchor. For example, the 1/4” American Drop-in stainless steel anchor requires a 1/4” setting tool. •	The diameter of the hole that needs to be drilled in the concrete for the American Drop-in stainless steel anchor is equal to the outside diameter of the anchor. •	It is important to note that the designated diameter of the anchor refers to the inside diameter. •	The smaller diameter American Drop-in stainless steel anchor, such as the 1/4”, is considered a light duty anchor while the 3/4” is considered a heavy duty anchor. •	Once installed in the concrete, the American Drop-in stainless steel anchor can be bolted and unbolted without effecting the holding values. •	Each size of the American Drop-in stainless steel anchor comes in one length. 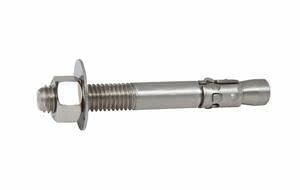 •	American Drop-in stainless steel anchors are not manufactured in a 5/16” diameter, a 7/8” diameter or a 1” diameter. Therefore, they are not available in those sizes.